Negative News Response Syndrome for Stocks? With the heart of the current earnings season for stocks running from October 16th to November 14th, it’s early to prognosticate with confidence, but there appears to be a shift in how the market is responding to good and bad news. In 2017 and most of 2018 bad news was harmless and good news was richly rewarded. In this 3rd quarter of post tax cut booster rockets and a strong economy, investors expect another stellar earnings season. Indeed, in the early stages we read that roughly 80% of company earning reports are beating lofty consensus estimates, yet the market isn’t rewarding the good news thus far, but using gap higher openings to Sell! When winners like CSX, Netflix and United Health lose favor with the wall street fashion show, one wonders what other surprises await. 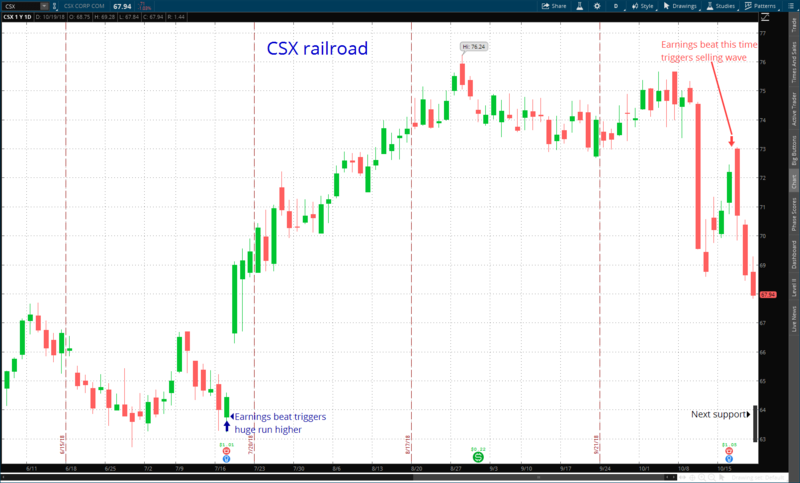 CSX has been a strong performing rail stock with literally tons of new business and strong revenue growth in every commodity sector. Prices gaped higher on the latest report and immediately went into reverse, now trading at fresh 3 month lows. 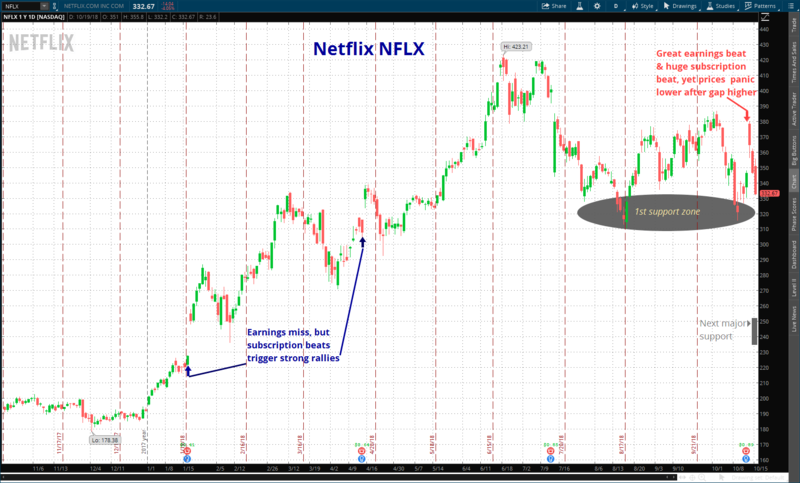 Netflix (NFLX) often misses earnings (which are unimportant in this subscription economy), but as long as subscriber growth surprises to the upside, prices always shoot higher. This time NFLX actually beat earnings consensus for a change and had a huge beat in new subscribers. The stock exploded higher on the news as one would expect and immediately lost everything and more within a few days. 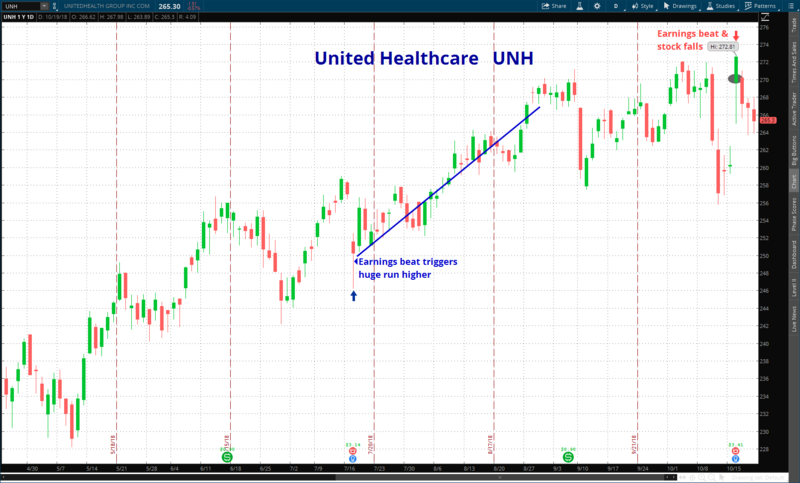 United Healthcare (UNH) has been a stalwart performer in this Bull market and any pullback has been a gift for investors. Yet, even UNH who surpassed earnings expectations once again, failed to hold a rally and quickly sold off from record highs. Not all good news has been kicked in the teeth as witnessed by the strong response to news of Johnson & Johnson (JNJ), Procter (PG) and Paypal (PYPL) jumping sharply higher on their reports of better earnings – at least so far! As our comments have highlighted in recent weeks, this is a period where the Macro overshadows the Micro. It’s hard to see the good trees when investors worry of potential forest fires from all directions – such as higher interest rates and slowing global growth. With 738 companies reporting quarterly results this week, a better read on the degree of market skepticism should become more apparent soon. The tea leaves of earning reports that will be most laser focused upon this week are Amazon, Alphabet, Boeing, Microsoft, Union Pacific and Visa. If these companies report Bullish numbers and quickly reverse lower on the 24th/25th, then we will have strong evidence of a negative news response syndrome with staying power. Should this manifest, it will signal that the macro uncertainties surrounding global growth, higher yields and political gridlock require a more extreme capitulation in price for a longer duration before funds are willing to buy equities heavily. A climax is building near term as many stocks are hovering near multi-month support hinting a need to wash out bargain hunters or firmly move back above the markets 200 day moving average. The good news is that technicals are quickly moving toward an oversold zone and a break to new October lows may lead to good longer term values for any condition other than a recession. Should the current October market lows hold this week at Dow 25,000 and S&P 2,700, then the current trading range may still hold until a pivotal election day reckoning.